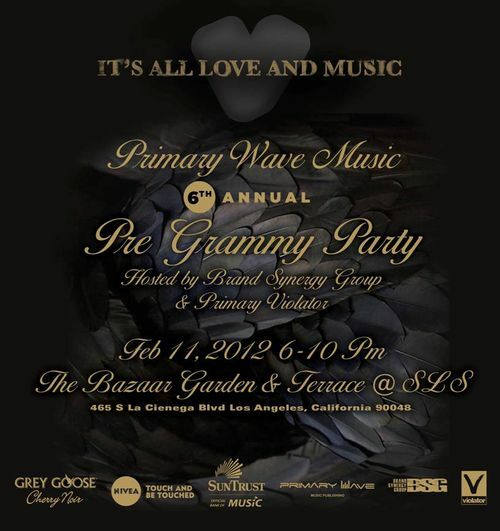 You’re invited to join Primary Wave Music and our Grammy Nominated artist roster including CeeLo Green, celebrate a night of LOVE & MUSIC at the 6th Annual Primary Wave Music Pre-Grammy Party @ SLS Hotel. 6:00 pm – 10:00 pm at The Bazaar Garden & Terrace. Cocktails and passed hors d’oeuvres from The Bazaar by chef Jose Andres, a NIVEA photo-booth, DJ duo POSSO , D-Nice. To RSVP email awatkins@primarywavemusic.com if you’re able to attend invite is Non-Transferable does not guarantee a +1.